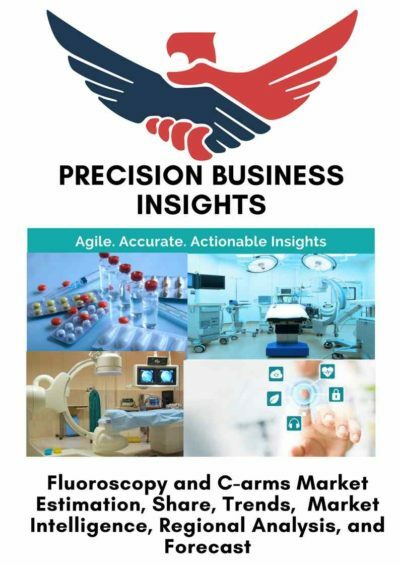 Fluoroscopy and C-arms Market by Product Type (Fluoroscopy, C-arms), by Application (Cardiovascular, Orthopedic, Gastrointestinal, Urology, Neurology, Others), by End User (Hospitals, Diagnostic Centers, and Others), and Geography. Fluoroscopy is the study of the moving body structures, in which a continuous X-ray beam is passed through the part of the body that is being examined. The image id transmitted on to a monitor on which the motion of the body part can be seen in detail by the healthcare professionals. The C-arms are the medical devices with C-shaped arm which connects both the X-ray source and X-ray detector. The recent innovations bought fluoroscopy devices use flat panel detectors for the digital image processing which helps in the reduction of the radiation dose that is administered to the patient. The technological advancements are adding fuel to the growth of the fluoroscopy and C-arms market. The rising geriatric population and increasing count of the interventional radiology surgeries are driving the growth of the market. The improving healthcare infrastructure is also adding scope for the development of the market. The increasing R&D activities and launches of new products are affecting the growth of the market. However, the stringent government regulations is likely to hamper the growth of the market. Geographically, global fluoroscopy and C-arms market is segmented into North America, Europe, Asia Pacific, Latin America, and Middle East and Africa. North America fluoroscopy and C-arms market holds larger revenue share owing to its larger adoption rate and well-developed healthcare infrastructure. The Asia Pacific region is expected to show significant growth over the forecast period owing to its improving economy and improving healthcare sector.